Burdock - The Tenacious Tonic - Treatment for Cancer? Burdock root has become popular as part of a tea to treat cancer. Burdock’s use against cancer goes down through the centuries and has been used as a tumor treatment in Russia, China, India and the Americas. In the United States, it was an ingredient in the popular but highly controversial Hoxsey Cancer Formula, an alternative therapy marketed from the 1930s to the 1950s by ex-coal-miner Harry Hoxsey. Some studies show anti-tumor or anti-mutation activity. The National Cancer Institute became interested in burdock as part of its Designer Foods Program, an effort to use biotechnology to introduce cancer-preventive chemicals into common food crops. Burdock’s action is mild, but real. It has antibacterial and antiviral powers, and it reduces blood sugar, which helps prevent diabetes. 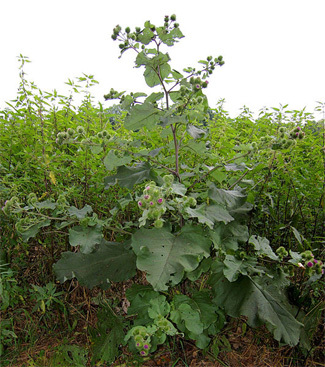 Burdock has value as a tonic, a subtle strengthener with cumulatively helpful effects. Burdock root contains high amounts of inulin and mucilage. This may explain its soothing effects on the gastrointestinal tract. Bitter constituents in the root may also explain the traditional use of burdock to improve digestion. It also contains polyacetylenes, shown to have antimicrobial activity. Burdock root and fruit also have the ability to mildly lower blood sugar (hypoglycemic effect). Herbalists generallly recommend 2–4 ml of burdock root tincture per day. For the dried root preparation in capsule form, the common amount to take is 1–2 grams three times per day. Many herbal preparations will combine burdock root with other alterative herbs, such as yellow dock, red clover, or cleavers. Use of burdock root at the dosages listed above is generally safe. To brew a pleasantly sweet-tasting tonic tea, boil one teaspoon of crushed, dried burdock root in three cups of water for 30 minutes. Drink up to three cups a day. Burdock (Arctium lappa) is native to Asia and Europe. The root is the primary source of most herbal preparations. The root becomes very soft with chewing and tastes sweet, with a mucilaginous texture.